Whether a company sells, invents or builds, all businesses share one universal similarity: an organisation can’t move forward without people. With the total cost of an employee leaving in excess of the employee’s annual salary, retaining staff and moving forward in harmony means the difference between flourishing and dying for any organisation looking to prosper in this economic world. The cost of attrition is phenomenal and despite research into the area, it is still one of the biggest challenges faced by organisations. How good office design can reduce attrition. We’re delighted to offer this new white paper for free to our blog subscribers – just subscribe to the blog using the form below and we’ll send you a link to download it. Already a blog subscriber? Just contact us for a copy, or click the link in your subscriber email. 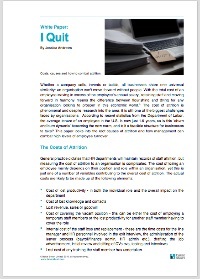 Do you have a problem with staff attrition? How are you dealing with it? Download the white paper, we’d be interested to hear your thoughts.